Good posture is critical to proper breathing, and allows for free technique. The student should not allow himself to become sloppy in this area, as it will take twice the time to unlearn any bad habits. Posture starts on the floor and works its way up. Good posture begins with the FEET: They should be flat on the floor, and where they would be if the player were to stand up. Continuing up is the BACK: The back should be straight, but relaxed. 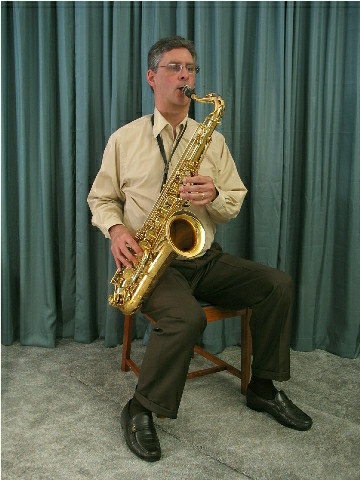 The weight of the saxophone is best supported by a straight back. Hunching forward only makes the horn seem heavier! Good breathing is easier by a straight back too. The SHOULDERS should be relaxed: Relaxed shoulders are easier to achieve when the back is in good position. This will also permit free breathing, and prevent soreness and fatigue. The HEAD: Should be straight as if there were no sax sticking in your face! RELAXED, BREATHING, PREVENTION OF FATIGUE, and FREE TECHNIQUE are the goals of good posture. As you study the photo below, you may disagree with some of my suggestions, but we can agree on the principles above. "POSTURE IS A REFLECTION OF ATTITUDE"
A special word to alto players… The saxophone was meant to be played on the right side of the body. There are MANY alto players—who are far better players than I am—who play with their horns between their legs. 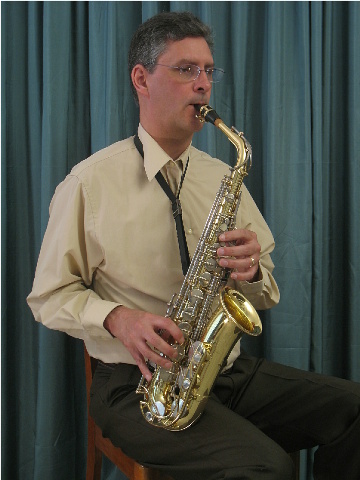 If you look at the lower stack of the sax, you will notice that the keys are on the SIDE…not on front like a clarinet. (Why don’t you see clarinetists holding their instruments to the right?) While holding the alto in front, the common result is to rest the right wrist on the leg. Yet we teachers scream at our young clarinet players for doing just the same! When the right arm is pinned to the thigh, freedom of movement is taken away, and thus stifling technique. The argument can be made that while standing, the alto is more in front than on the side; and the position of the horn is simply maintained when seated. I can see that point, but the difference is made when the legs come into play.